Staff Sgt. 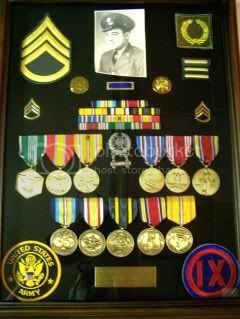 Norman Ansel WWII Veteran (my dad.) Memorial Day 2010. Over 1,000,000 Americans have paid the ultimate sacrifice for freedoms sake, since the founding of this great nation. That number continues to go higher each time a telegram comes stating “We regret to inform you!” America’s sons and daughters are still being lost to the ravages of war, and my heart breaks for their families. We celebrate Memorial Day on the last Monday in May to honor the fallen hero’s from past wars. The on going conflicts in Iraq and Afganistan continue to tax our resolve as a free Democratic nation. We may disagree on politics and policy, but may we always embrace the individuals who serve, protect, and defend the Land of the Free and Home of the Brave! May we not dishonor them, and their service to our country by forgetting the price that was paid for that freedom. I sometimes wonder where would France, and Italy, Great Britain, and the whole of Europe be today, had not the United States of America taken a stand for freedom. Tens of thousands of our finest young men and women rest on foreign soil. They did not come home to their mothers, fathers, wives, girlfriends, children, relatives, and friends. For them the promise of “Life Liberty and the Pursuit of Happiness was over!” Most cut down in the prime of their lives. Dreams, hopes, and aspirations terminated by henchmen of evil. As a nation we are not perfect, but as I look around I feel we are this planets last hope. As nation after nation gives into the demands of terrorist, true freedom, for many, is on the brink of extinction. Just this past week I read where the United Kingdom is considering removing any record of the Holocaust from it’s textbooks, because it offends Muslims. You see many Muslims deny that the Holocaust ever happened. On the same page I also saw where a 13 year old Schenectady New York schoolgirl was suspended from school for wearing a rosary around her neck. Our Constitutional freedoms, that these valient warriors fought and died for, are increasingly at risk from our own politically correct leaders. Not only is our Constitution under attack, but America’s Christian heritage is being denied and maligned, by those who want to rewrite and reinterpret our founding fathers words and intentions. I implore you today, as you enjoy the freedom to have a picnic, or day at the lake, or just relaxing in your home, remember those fellow Americans who made the ultimate sacrifice. If we fail to pass down to each succeeding generation the truth of freedoms cost, then we will cease to be a shining light in a dark world. I for one promise never to forget, and I want to express my sincere respect and gratitude for those that answered the call, both living and deceased. You are all hero’s in my eyes, and this country owes you a debt of thankfulness like no other. Was asked to go out walleye fishing early this morning by my friend John Poniewozik. Some friend he turned out to be! We caught 4 fish total, but “WE” really didn’t catch four fish, as John caught them all. I did have one bite, but missed setting the hook, so I blew the only opportunity I had. Actually they just weren’t biting very well, and I’m sure the recent rains didn’t help very much. The water is just starting to clear up, and maybe the next couple days fishermen will see better action. We were fishing in about 20 foot of water, and had to keep our rigs close to the bottom, where we were marking fish. We had a lot of boats around us, and we never saw anyone “killing” them either. It doesn’t really matter, as the sun was shining, a gentle breeze was blowing, and it was just plain relaxing being on the water. I really appreciated John taking me out, as it’s been a few years since I’ve been on the big water. I’m more of a canoe, or off the bank kind of a fisherman. As the old saying goes “A bad day of fishing, is still better than a good day at work!” John was a good host, as he even filleted the fish and presented them to me before we parted ways. I thank you John and so does my wife, as you just supplied our supper. Baked potatoes, salad, and deep fried walleye; ah it doesn’t get any better than that! Have a blessed Memorial Day everyone, and be sure to remember those who served, and paid the ultimate sacrifice for our freedom. Turkey season is winding down, and depending who you talk to, the birds are still available for the taking. My brother Darryl, who always gets his bird, called me two days ago to report his latest success. He got his bird alright, but believe me he had to work for it this year. He’s been hunting about 30 miles west of Hillsdale, and has quite a story to tell. Late in the afternoon this past Monday, he and his hunting partner Dan were doing some “running and gunning” on a friends farm. The birds weren’t responding to their calling, but they knew there were turkeys on this property. They stuck a jake decoy in front of them then called from a few yards back in the woods. There was no responce, but then Dan thought he saw movement to their left. sure enough 3 jakes were walking the tree line and had seen the decoy. A few yelps later they were showing off and headed their way gobbling and strutting. Obviously all the comotion caught the attention of the boss Tom in the area, as he was headed for the three Jakes, from the opposite direction. 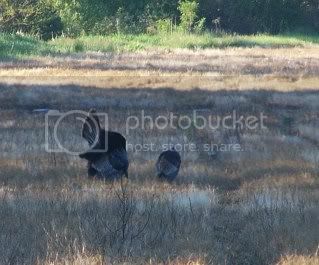 The big bird didn’t see the decoy, but his path was going to lead him within 35 yards of Darryl’s position. Darryl’s bird weighed 26 pounds (big bird) had long hooked spurs, and close to a 12 inch beard. It no doubt was a 3-4 year old, who was looking for some action, just “not” the kind he found. Way to go Darryl. One of the best things of this whole story is he got it on film. I can’t wait to see those three Jakes, and their reaction toward their downed comrade. This is one of the reasons I love to golf. I see more wildlife driving out to Deme Acres than anywhere else in Monroe County. 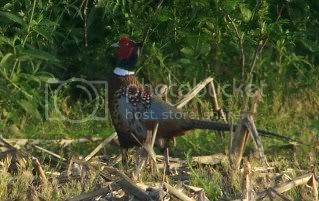 This is one fine looking rooster pheasant I saw this morning, and I got a great snap-shot of him strutting around a hen. This is a mature bird, as his white ring goes all the way around his neck, and his tail feathers are very long. Pheasants are not native to the United States, but originally came from China. They were introduced to the willamette Vally, in Oregon, in 1881. It wasn’t till 1910 that they were introduced to the Dakota’s, and pheasant hunting is legendary in these two states. Almost all of the 50 states have a population of ringneck pheasants, which bring in some serious revenue from the hunters. When I was a kid my brothers and I used to have a little brotherly competition on who could put the most pheasants in the freezer. Some years we could put 40-50 birds on the table. In those days we had a good dog, and the farmers always left some cover around their farms for the wildlife. They didn’t “strip farm” like they do now-a-days. Thank God for that dedicated group of volunteers called “Pheasants Forever!” They have helped with habitat improvement in Monroe County, and we are starting to see some results from all their hard work. Even my brother-in-law Pat has gotten involved with this group. He owns about 8 acres that is planted for deer and pheasant habitat, and every now and then I can hear a rooster cackle coming from his field. It is a sweet sound to this old pheasant hunters ears. 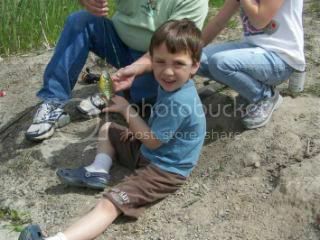 This is my great nephew Tristan, and trust me he is “great.” He is my brother Darryl’s grand-son. His dad Derek is one of the managers at the Cabela’s store in Dundee Michigan, so this kid has the “outdoors” inbred into his genes. Tristan was hunting around the Gaylord area, during the first hunt with his cousin Tanner (T.J.) as the whole Darryl Ansel family enjoyed a few days on Heart Lake. 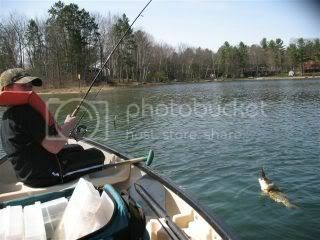 The second photo is Tristan reeling in one of the several small mouth they caught, and released, between turkey hunting lulls. Good story Tristan. I think this kid will have many stories to tell in the future, as his whole family is really into the “outdoors.” Even his mother Mary shot a huge Tom last year, but hasn’t filled her tag this year. There’s still a few more days of season left, so who knows, maybe some of those unused tags will grace a gobblers leg yet. Last year we took 9 birds in our family. So far we’ve only taken 2 this season. The weather did not cooperate, but that’s Michigan. If this don’t get your blood pumping then you need a heart transplant! 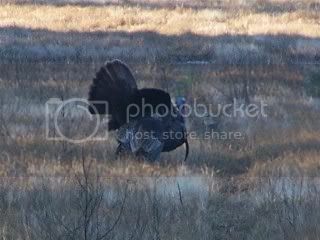 Here it is , the winding down of the turkey hunting season, and this huge Tom is “strutting” his stuff. There is a hen just off to the left of this bad boy which I will show you in another picture. I have taken almost twenty turkeys in my hunting career, but this one is probably the second biggest I’ve ever seen. The biggest being a U.P. monster that I failed to put on the ground. What your looking at here is a true 12 inch plus beard, and an upper 20 pound class bird. 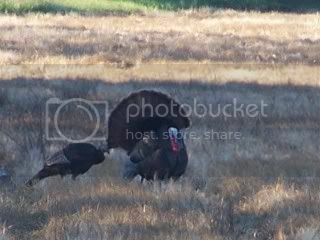 I shot an 11 inch 26-1/2 pound bird last year, and trust me this one is bigger. Trophy Tom and his girlfriend! Grandson Logan was in town from Chicago (first picture) so we had to have some of his buddies (cousins) come over. Ava is in the second picture, Jacob the third, and Kyle the forth. My wife and I, along with Kyle’s mother Tara (our oldest) took them to Ash township park for several hours Saturday. They played on the “Funscape” first, then grandpa took them fishing in the little lake the township has next to the park. I had em all help me dig for worms before we left, but it was pretty slim pickings! 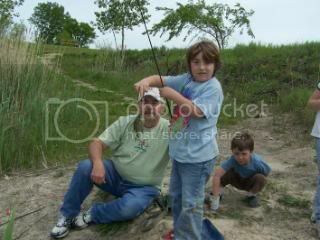 Jacob caught the first “lunker” followed by Kyle, Logan, and Ava. It was Ava’s first fish, and she did a great job of reeling in her prize. 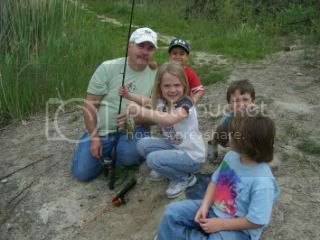 Actually all the kids did a fine job of handling those record breaking sunfish and bluegill. It’s amazing they did so well, in spite of my exuberance and lack of patience. It took us awhile to find where they were hiding, but when we did, it was fast and furious. 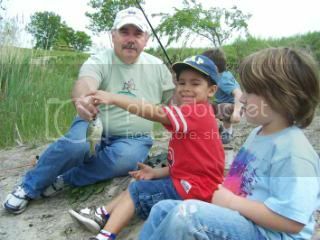 Each kid wanted to “release” their own catch, and made sure they actually saw the fish swim away, unharmed. We had a great time at the park, and took them to a dairy farm for ice creme, and did marshmallows in the evening. Ava and Jacob spent Friday night with Logan, cause they don’t get to see their Chicago cousin often enough. Now we have a great little fishing hole to take the grand-kids to when we have them. We enjoyed our time with them, but grandma and papa are going to bed early tonight, and try and recuperate for the new week. What a great time of year for outdoor enthusiast. Michigan has Spring turkey hunting, and RAIN! We have mushroom hunting, and RAIN. We have the start to a great fishing season, and RAIN. 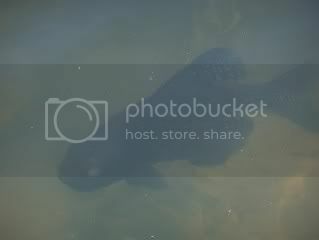 In fact we’ve had so much RAIN that I took this picture of a very nice crappie in my new back yard pond! Just kidding, but I do have a new pond encompassing most of my back yard. The farmers that got their crops planted, and felt they were a leg up on the growing season, may loose sections of their fields due to the water on the ground. As I took the grandkids to school this morning we passed several planted fields that looked like small lakes. We had our share of showers in April, and May seems to be even worse. Should I be building an ark? Anyway I can’t wait to get some better weather around here, so I can try and put some of those jumbo crappie’s on a stringer. 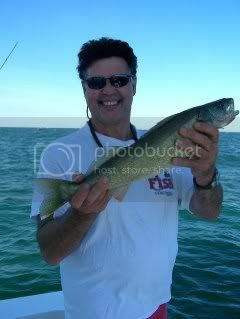 I also got an offer to do some early season walleye fishing from a new friend of mine (John Poniewozik) as soon as we can work out a good weather non-baby sitting day! I would love to put some fish in the freezer, as I’m getting low on fillets. 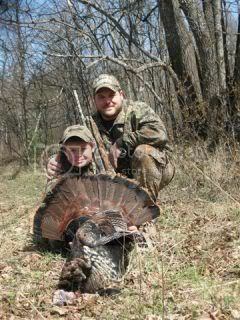 Turkey season is winding up, and so far the Ansel’s didn’t have near the season we did last year. 2009 saw us go 8 for 9 in putting a turkey dinner in the freezer, but this year only two of us have been successful. I think we’ll blame it on the wet weather. This has got to be one of the most perfect racks I’ve ever seen. It’s a 12 pointer with less than 2″ of deductions on the scoring. It grossed right around 170 inches, and believe it or not, the guy that shot it has two bigger ones under his belt. 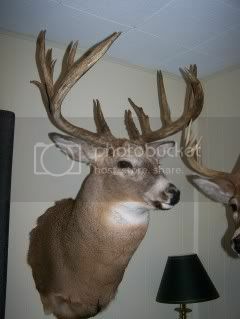 He has another big non-typical, and is waiting for the taxidermist to finish his 27 pointer from last year. That’s right I said 27 pointer that scored in the 190’s as a non-typical. I can’t mention this hunters name or even the area he hunts in, as he would kill me. When you have a “honey hole” like he does, who can blame him. 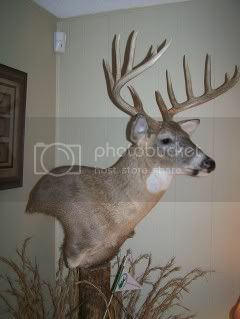 He hunts in a QDM area, and the proof that Quality Deer Managements works, is hanging on his walls. He’s instituted a minimum of 170 inches before you release an arrow or fire your gun. The motto is “let em go, and let em grow!” Food plots, plenty of water, woods, and a good bedding area make for quality bucks that any hunter would be glad to hang on his wall. Of course it helps to be bringing in a six figure income to support your habit, but hey it’s only money! Somewhere out there may be roaming a trophy buck with your name on it. You never know. Of course one mans “Booner” is another mans 4-pointer. Trophies aren’t really measured in inches, but in the thrill of the hunt, the camaraderie of friends, and the sharing of natures bounty with family and loved ones. The “Morel” of the Story is DELICIOUS! One of the distinct advantages of being in the woods during turkey hunting season is the possibility of finding some morel mushrooms. I stumbled onto these while checking out some fence rows near my house. I let them sit in water over night, and then made sure there was no sand or small bugs inside the spongy surface or hollow stem. I usually use an egg and milk mixture along with flour salt and pepper, but decided to fry these Au-natural. I used butter in the frying pan and of course added salt and pepper, and they were delicious! I could make a meal out of just wild mushrooms. On a morel mushroom the “cap” (spongy looking out side) is attached to the stem (usually a lighter color than the cap.) The bottom of the cap is attached to the stem and they appear to be one piece. The cap is generally longer than the stem, and if you cut one in half, it will be hollow from the bottom of the stem to the top of the cap. The outside of a mushroom (cap) is full of valleys and ridges, and will resemble a sponge. They vary in color from light sandy to dark brown. They like sandy soil, moisture, and dead trees. Another Michigan morel is called the half-free morel and it may be eaten. It has a smaller cap and longer stem than a morel, and the stem is connected half way up inside the cap. Two mushrooms to stay away from are the common false morel (verpa) and the Beefsteak. while some people can tolerate the common false morel everyone should stay clear of the beefsteak. The poison in these mushrooms is called monmethylhydrazine, and is found in rocket fuel. 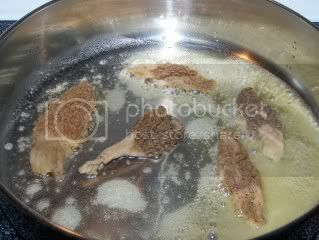 To get more information and pictures go to michiganmorels.com.